The USCF has approved another electronic scoresheet device: The ChessNoteЯ by Black Mirror Studio, LLC, which runs exclusively on Nexus phones. In our opinion, letting players record games with phones is a bad decision. It creates cheating opportunities & places additional burdens on TDs. Monroi, eNotate & PlyCount devices are easily identifiable. Now, we need to know what brand phone people are using, ascertain who is using ChessNoter or an unapproved app & deal with opponents or their parents who are disturbed by, or jealous of, the new product. 1. A player must inform the Chief TD of his/her intent to use ChessNoter before round one. 2. Your device must remain at the board during the game. 3. Any player violating rules 1 or 2, using other phones or other chess apps is subject to immediate forfeit & ban. 3-RR. G/40 d5. Chess Mates Academy, 75 E. Cherry St., Suite 11, Rahway, NJ 07065. EF: $25, $20 Westfield CC members. Prizes: $60 to first in each section. Register: 12:00-12:25 p.m. Rounds: 12:30, 2:15, 4:00 p.m. Contact: jpmoldovan@gmail.com. Note: Please bring a chess clock. This event, which should end by 5:30 p.m., was designed to give our players a low-cost, 1-day alternative to the tournaments being run in Manhattan & Cherry Hill this week/weekend. Parking in the lot across the street (behind The Waiting Room) is free on Sundays. The Westfield Chess Club will be closed today, Sunday, December 24th, & next Sunday, December 31st. Our next tournament will be G/45 Quads on Sunday, January 7th, 2018, at 1 p.m. If you are looking to play before then, we suggest Chess Mates' New Year's Eve Quads on Sunday, December 31st. The event starts at 12:30 p.m. & should be done at 5:30. Bring a clock. The Westfield Chess Club wishes its members and friends the happiest of holidays. We thank you for making 2017 our best year to date! 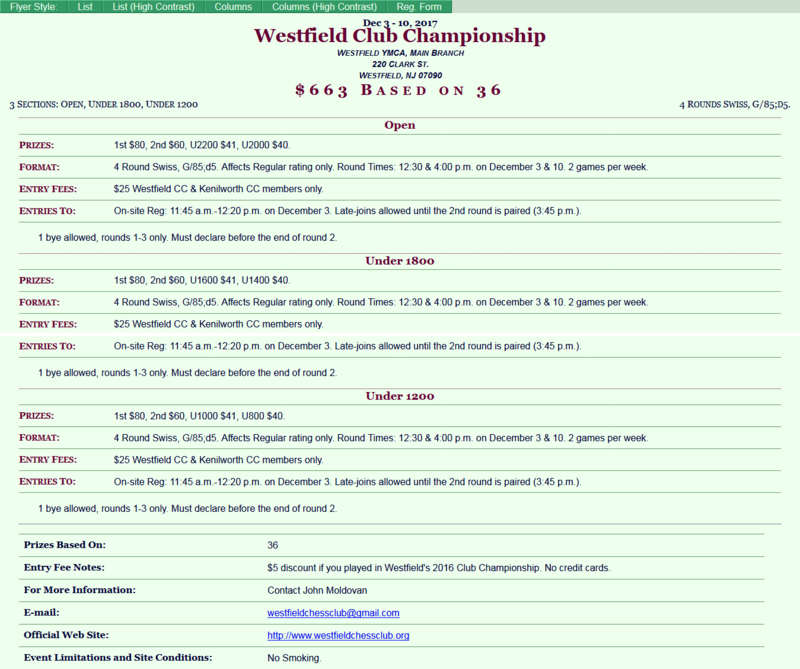 NM David Grasso won the Westfield Club Championship held December 3rd-10th. LM James West, Merric Hu, Steve Hrop, & Boyang Zhao split the 2nd, 3rd, U2200 & U2000 prizes. Bowen Liu won the U1800 Section. Benjamin Liang was the U1200 Section winner. 52 players participated in the 3 sections. Thanks to all for playing! The Club Championship concludes today. We will be using rooms 107-109. Round 3 begins at 12:30 p.m. The 4th/final round is at 4. Players may take 2 half-point byes. Pairings revised 12/8 @ 5:50 p.m.
Subject to change if there other withdrawals. Todd Lunna, Terrence Fricker, Ellen Wang & Aayush Ajith withdrew. Players will toss for color. The 4th/Final round is at 4:00 p.m.
NM David Grasso leads the Westfield Club Championship at its halfway point. 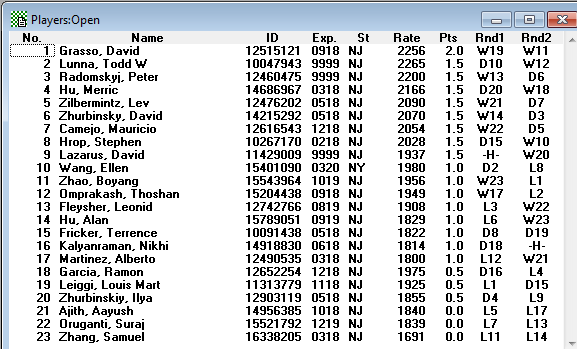 8 players, including former champs LM Todd Lunna, LM Peter Radomskyj, Lev Zilbermintz & David Zhurbinsky are just a half-point behind. Reigning champ Sanjana Vittal is not participating. 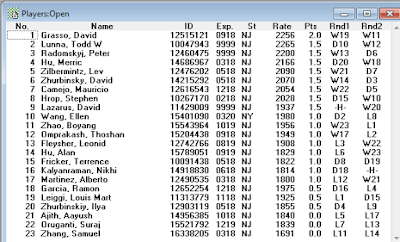 Swagnik Roychoudhury (1583), Harrish Vijay Parasara Ramanujam (1471) and Nishant Lebaka (1421) lead the U1800 Section. Benjamin Liang (1186) heads the U1200s. The event concludes next week. Belated reports on & photos from our Summer & Fall Scholastic tournaments will be posted in the near future. 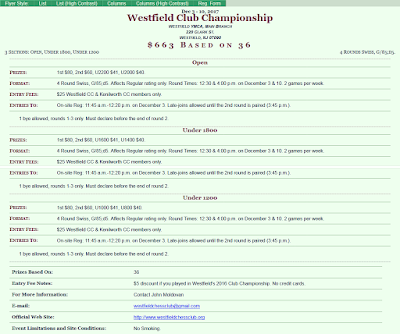 Westfield Club Championship Begins Today! The Westfield Club Championship begins today! Registration is 11:45 a.m. - 12:20 p.m., with the 1st round starting at 12:30. Updated 3/20/2018 @ 6:30 p.m.
All events start at 12:15 p.m. unless otherwise noted. 24 G/50 Quads 1:30 p.m.